I’m back with another recipe from what has become the fall and winter tradition in our household, Sunday Soup Day! 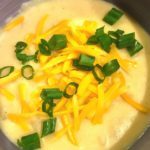 This past weekend I had a craving for something richer than a broth based soup, so I turned to this comforting Crock Pot Potato Cheddar Soup. It’s rich, hearty and really hit the spot on a cool Sunday night after a long weekend. 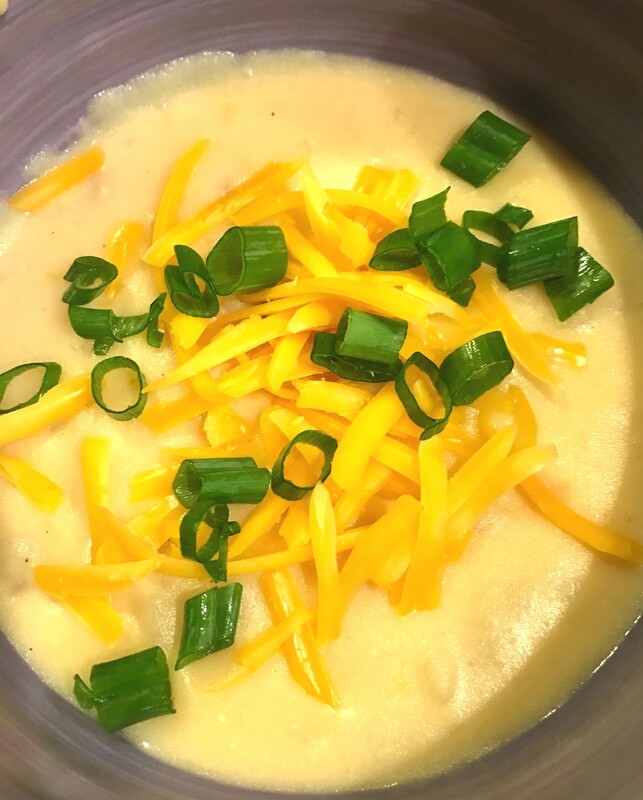 A couple tips for making this super simple soup. You’ll need to cook the bacon ahead of time, so go ahead and use my Fool Proof Baked Bacon Method. You’ll be glad you did. Also, this recipe calls for a lot of shredded cheese. If you’re in a hurry, pre-shredded will do, but it really pays to buy a couple blocks of cheese and shred it on your own. Why you ask? Check out my Instagram feed for Why You Should Shred Your Own Cheese. And finally, my apologies for the lack of quality photos with this post. First and foremost, as I’ve said before, I’m not a food photographer, but a trained chef, so for me food quality comes first. Yet, I understand the importance and draw of quality pictures on a food blog. Alas, this past Sunday was a busy Sunday and my kids needed to eat! I only had time to snap this picture in bad light before they formed a mutiny against me. I’ll be better next time – I promise. Well, actually, the time after next. Because I was multi-tasking and snapped a picture of my next recipe post, Lazy Sunday Sauce, at the same time. Oh well. We got those items out of the way – get to cooking! Enjoy! Cook bacon according to package instructions or use the fool proof method described above. When bacon is cooked, add bacon, potatoes, onion, stock, salt and pepper to a crock pot and cook on high for 2 – 3 hours (low 4 – 8 hours), until potatoes are tender. When potatoes are tender, melt butter in a pan over medium heat. When butter is melted, whisk in flour until there are no lumps. Cook flour for 1 – 2 minutes, stirring often. Add evaporated milk and whisk until well combined. Add this mixture. half of the cheese and the milk to the crock pot and mix until everything is combined well. Cook for another 20 minutes until warm throughout. Taste and adjust seasonings as necessary. Serve hot and garnish with remaining cheese and green onions.